MADSEN and our family go way back. 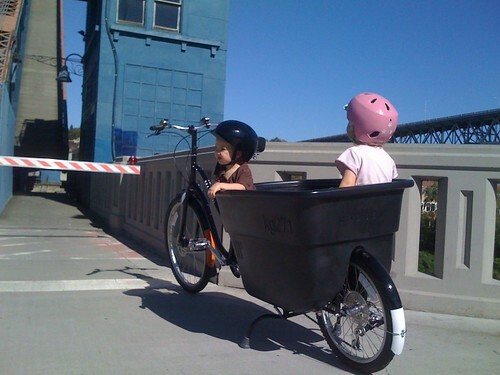 This blog got started with a review of the then brand-spanking new MADSEN "precious cargo bike" back in 2008. Since then, we met the MADSEN guys, built it into a baby-hauling bike, brought home a Christmas tree on the Madsenbaum, took 4 kids on wild rides through Ballard, filled it with ice and frosty beverages for sunsets at the beach, transformed it into a Gelato Bike for our friends' wedding, and spent many a day just out on the bike exploring the city. We ♥ our bucket bike. We've been bugging Jared Madsen from time to time about the promised kid canopy/raincover (ETA now early 2011), and with ideas for improvements, and were delighted to hear this summer that the new model was almost ready for release. Jared offered to send us a review bicycle (we paid full price for our original), and we happily accepted. We were going to send the original back, but they liked the Gelato hack and told us to keep it around for events. Any Seattle folks that would like to borrow it are most welcome. We've had a few months now with the MADSEN 2.0, and we LOVE it. It's got all the improvements we hoped for and more, with only a few downsides or quibbles. And we've spent the past two years collecting, demoing, and otherwise obsessing about family bicycles, so I can say that we've pretty much tried them all. 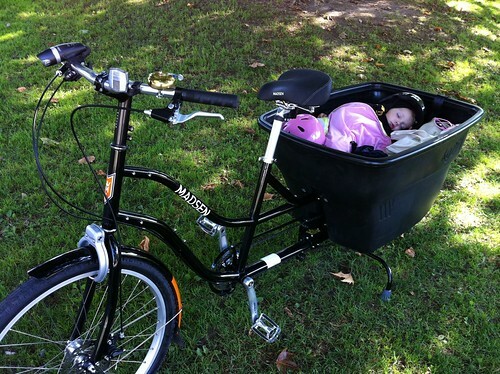 For young families on a budget, with infants, toddlers, and preschoolers, especially more than one, a MADSEN is the bike. Yes, we love a bakfiets and have lust in our hearts for a Bullitt. They both have the very real advantage of kids/cargo in front, which makes riding a more social experience, and allows for easy supervision of kid cargo. But a bakfiets is honestly better suited to flatter towns than ours, and the lighter/sportier Bullitt does hills well but lacks in kid + cargo capacity, and costs well over $3,000 when you factor in kid-carrying accessories. Don't get me wrong - you really should demo a bakfiets-style bike if you can, and if you are not regularly climbing steeper hills or going long distances, and can front the cost, it might be your perfect family ride. And the sharp-eyed reader may have noticed that we also have a new xtracycle in the stable. I'm gaga over our new longtail, and a review will follow. But the MADSEN comes ready to roll with seats and belts for 4 kids, whereas it can be expensive to add young-child carrying options to an xtracycle. And the MADSEN does naps well, which is crucial with the littles. On the xtracycle, I've resorted to sticking Luc in the freeloader bag hammock-style (don't tell my wife), adding a wacky noodle to the front seat for head support, and other hacks, but on the MADSEN it's trivial to convert to "nap mode" and ride. Trust me, they will fall asleep when you ride, at the most inopportune times. Frame is now made in Taiwan rather than China. The welds are much improved. No "boogers." Bucket now from Idaho, and seems lighter. It also rides lower, as they revised the rear-end frame to be sturdier and allow the bucket to attach more securely. Lower center-of-gravity is a good thing. And we still love how easy it is to just throw kids & stuff in the bucket and go. The bucket is still easy to "hack," once you come to terms with drilling it. Viz our new rear light. Front end geometry much revised, with help from Aaron of Aaron's Bike Repair. HUGE improvement. I didn't mind the "flop" (floppy handling) of the previous MADSEN so much, but many did, as it made handling at slower speeds dicey. In fact, we did have 2 slow-motion tipovers on the original MADSEN. No one was hurt (the bucket is good that way), but it got a bit embarrassing when Drew started coaching us from the backseat and requesting that we not tip the bike. The 2011 bike handles like a dream at low speeds now, very stable, even more like "a normal bike." And I haven't ridden hands-free yet, but apparently it tracks well enough for that now. Dutch-style front wheel lock. Yes!!! You will use this all the time for running into stores. So convenient. New custom color-matched stem that bolts on tight. This is both better-looking and reduces flexiness in the handling. Between the new geometry, lower/sturdier rear end, and this stem, the bike is noticably less flexy with a big load. Stand and deliver. Spiffy handlebar, and brake levers that incorporate a simple button lock. This lets you lock the brakes to prevent the bike from rolling off the stand. Great idea, one that other bikes with centerstands would benefit from. Speaking of the stand, there are now two bolts that solve the loosening/twisting issues from our last bike. Solid. My favorite centerstand (the bakfiets' is rock-steady but futsy to stow, the xtracycle kickback flips up when moving the end of the bike around, etc ...). The chainguard is beefed-up (the old one tended to bend/break if kids climbed on it), and the chain management is improved with rolling idlers mid-chain. Ours is still a bit noisy, but I haven't bothered to tweak the rollers yet. The 38t front chainring is now easily user-swappable, and an extra 44t chainring is supplied, so you can choose lower gearing for hills and big cargo, or higher for speed. It is now easier to add a front derailleur for extra gearing, if you don't mind losing the chainguard. These options really expand the versatility of this bike, as the stock gearing on the previous model didn't meet everyone's needs, and upgrading was hard & expensive. The bucket now comes stock with 2 benches and 4 seatbelts. 4 kids, people! My car can't do that. You little hipster, youThe long-awaited front rack is now available, as well. This bolts securely to the frame (via braze-on's with classier hex bolts), which lets you carry a lot up front without affecting the handling. Believe it or not, families that use the MADSEN for transportation, kids, and groceries will want this rack. Multiple kids plus groceries fills up that bucket pretty quick. The rack has mounts for lights, and a coffee-cup holder! We recommend an OXO travel mug. Crane-style brass bell up front - loud, and with an impressive sustain. Cushy double-sprung seat has a lot of demo appeal, and will remain popular with more casual riders. The previous saddle was a disposable hiney-hater. New tires and goo-filled tubes. So far I haven't bothered to move our Schwalbe Big Apples over, which is saying something. But I will eventually for Kevlar-belted flat protection, extra cush, and reflection strips. Nicer stock pedals. The previous ones were junk. These are keepers - good-looking, with rubber for grip. Overall, MADSEN have gone from generic and cheap spec on most parts (to keep prices down, but with durability concerns), to still genericky but improved in function and/or quality, with some custom-designed for the MADSEN. The moves in manufacturing and the improved spec have resulted in an entirely justified price increase, to $1485. The ride position is now more decidedly and less-adjustably upright, but in more of a US "hybrid"-style position than true Dutch/English Roadster (with their relaxed seat-tube angles; I measured 74 degrees for the new MADSEN). This may be a benefit for casual riding, but for aggressive hill-climbing or speedsters, the previous riding position and adjustable stem was better. Despite being a bit of a snob about such things, I don't mind the riding position that much yet, but those that do will need to do some stem/bar swapping. And I may eventually want to either take this bike more sporty, or with more "Dutchness" via a layback seatpost and rear-swept bars. Either of those options would yield a better torso angle and more efficient pedaling. The seat is cushy indeed, and good-looking to boot. But on longer rides cushy just means that the seat pushes up into your nooks and crannies, and starts to cause heat/sweat/friction issues. A stiffer sprung seat that supports your ischial tuberosities (sit bones) but lets the rest of "your situation" breathe is better. We moved our Brooks B67 over. But this is a quibble. Many will like this seat, and it's way better than the previous stock seat. The color-matched full-coverage fenders are still a big plus, but I miss the rear-fender reflector, and the rear fender extends too far in the rear, which makes it bang on curbs. Chain management is better, but still somewhat noisy. I've gotten used to it, and adjusting the idlers may help. MADSEN ships the bikes fully assembled and ready to roll out of the box, by drop-freight to your house. This worked well overall, but our stand was bent in transit. They sent out a new one promptly. Our front fork has a bit of an issue, which we only discovered when trying to upgrade to a front electric hub. The fork we got seems to have dropouts that are narrower than they should be, and the left dropout is a few mm behind the right. MADSEN is also replacing this under warranty. The seat belts are the same as the previously upgraded ones. They're still too "slippery." We have to loop them back through the buckle or tie them off to keep our wriggly toddler belted in. A rear disc brake would be still be nice to have. After 2 years, we did wear through our previous rear rim from braking. Granted, we do ride a lot, and could perhaps have done a better job keeping the brake pads free of grit. But it seems that 20" rims on load-carrying bikes would wear down faster in general. Our black bike looks great, with lots of color-matched parts, and more stainless bits, but the paint job is not as durable as our Dutch bike's galvanized and powdercoated frame was. Still no raincover. Others have made them, but we hope to see one soon from the MADSEN gang, as it is not optional in the winter months for serious transportational riding. It's still hard to find a MADSEN in bike shops, where post-sale support would be easier. This is not for lack of trying, I suspect, but more of a sad fact that most local bike shops are lacking in family and transportational bike vision. And there you have it, folks. You'll be seeing a lot more of the black MADSEN 2.0 in future posts ... it is an incredibly capable bike for the price. Compared to your family car, it can handle almost as much (multiple kids and a week's worth of groceries), and it's so easy to just load and go, with free parking out front, every time. Yes, this is a furnished-for-review bike, but one that I would certainly have schemed a way to buy. Especially with today's Black Friday deal! MADSEN has had some epic deals on scratch-and-dents in the past, and today does not disappoint. New 2010 MADSEN's are only $999 (plus $150 shipping), which is almost $500 off. That is one smoking deal. Put one under your Festivus pole this year. Thanks for the thorough review, Julian! Glad to see that Madsen is heading in the right direction and taking their customer feedback into consideration. I love this idea and I really want to get one ... but my house is a half flight of stairs up to the front door, no other entrance, and it's outside DC, so I wouldn't be able to leave it outside. Where do you store yours and do you have any advice? The only thing I have is a very small space under the front stairs, but only part of it would fit and it would be hard to manage even that little bit because of how it's laid out. We're lucky to have a garage repurposed as a bike stable. With a bomber Abus chain lock for frame and front wheel, and a cable for seat, you might get away with outdoor storage, esp if you fabricate a cover for the bucket (twould be easy, with a bungie cinch under the lip). Or rent/borrow a bit of space in a nearby garage? Good luck! Inspiring review. Thanks for spending some holiday time on it. Great review! I've seen a few madsens rolling around in Utah and I've always wanted to try one and own one! I've always admired their extremely affordable prices and the newer model doesn't seem to disappoint at all. Thanks for the great info, and for sparking my interest in riding one again. Great writeup! The absence of a rear reflector seems odd. And, still no mounting option for a rear blinky light? (that always bothered me about our early model). Otherwise, love the improvements. Congrats on your new Xtra! Looking forward to the review. Thanks for the review. Our chain guard fell off after just a few weeks of kids stepping on it to climb in. And the chain ends up in a variety of locations, rather than just on the little velcro dohickey thingamajig it is suppose to be on. The 2011 looks like that has been addressed. How do you easily switch to "nap mode"? We've only been successful napping on a few occasions. (Take out the seats, cush the bottom with two pillows, add another pillow for back comfort and put two kids in. No seatbelts) I can't do that mid-ride unless I put the pillows under their feet first. Keep on them for the rain/weather cover. It is getting colder by day here and the littles are starting to ask for the car! There is a rear reflector on the seat post, but it was better on the fender. We bought a Madsen in Oct. and had the option of buying a new 2011 or a discounted 2010. We chose 2010 for both the price and some of the things listed in the review. I built my own roller chain tensioner since not having a lower guide on the chain made it very floppy. I cut the end off of a DH chain guide I had in the parts bin. It works great. It controls the chain, but is quieter than having the upper roller guide. I also find that the little piece of Velcro on the older upper guide wipes a lot of the road grime off the chain. Our lower roller is hinged so that if we smack it on something (and we have) it folds instead of bending. I can take pictures if anyone else with an older Madsen would like to see. Now that Christiania hoods and bakfiets.nl bungees and hooks are both available through Clever Cycles, why wait for a Madsen hood? Just attach the Christiania hood hoops to the box, loop bungees through the hood eyelets and attach the hooks to the box, et voila a Madsen hood. The Christiania hood has to be the 3-window version. It's absolutley lovely, and fits the Madsen box really nicely. Pics of mine in the Madsen flickr pool. I have an older Madsen and I love it! My husband does triathlons all over Ohio and our kids are finally old enough to bring easily. Does anyone transport their Madsen on their car? We have a VW Eurovan and I'd like to figure out a way to bring our bike. Hi Karen - I'd unbolt the bucket and transport that inside the van if you can, to reduce windage, and try the MADSEN up top on a tandem bike tray, or maybe hung creatively off the back of the van on a rear rack? Let us know how it works! I've carried mine on the back of our toyota sienna. We have a 5-bike bike rack that attaches to the hitch. The madsen goes on first, followed by two other bikes. A 4th bike won't fit. We've done this a few times for week long vacations without any trouble. Once we even used the bucket as storage as the van was getting pretty tight! Kids aside, can anyone tell me if the Madsen is big enough for a serious grocery outing? 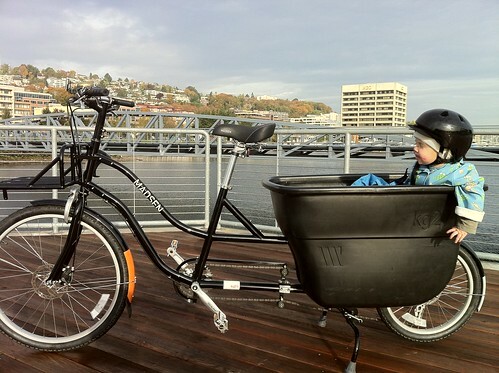 I am considering either a trailer or a dedicated cargo bike and love the look of the Madsen. The thing is that the bucket just doesn't look big enough for a week of groceries for four people. Some cargo trailers seem larger, if less enticing. Any thoughts? Plus the Madsen seems looooong. Any storage problems? I think it would have you covered. If you need, there's always the frame-mounted front rack (rare on a non-Dutch bike) + zip-tied laundry basket approach, which could swallow 2-3 more bags. The bench seats are velcro'd in, so remove easily for big grocery runs. We keep all our bikes in our garage, so no issues for us. Just a quick question I'm hoping you can help me with Julian. I live in Canada. Vancouver Island to be specific. But I'll be taking a trip to Vancouver in March and thought I might swing down to Seattle to buy a Madsen since I can't figure out where to buy one locally. Does Aaron's actually have the bike in stock? Ideally I'd like to try before I buy especially because I'm not 100% certain. With just one kid currently (one year old) I'm not sure that a Yuba Mundo or another longtail might not be a better option for us but I have to admit I find the "ready-to-ride" aspect of the Madsen very appealing and figure I can make upgrades after I get the bike if I want different tires, saddles etc. Anything you could let me know that might help would be greatly appreciated! What electric assist system did you install on this Madsen and are you happy with it? @Kristy ... if you can drive an extra 3 hours (or train), Splendid Cycles in Portland has Yuba's and the new 2011 MADSEN's in stock, ready for test ride, and no tax. Check with Aaron's, but I don't believe they have those in stock. Lots of xtracycles there though. @Jessia ... CleanRepublic.com Pro Kit with lithium battery. Fair and away best deal I've found, but getting the disc brake to work is still in process. Part of it is the ehub, part was a slightly bent fork from MADSEN (have a new one under warranty, but haven't put it all together yet). The e-hub's been working well on our xtracycle, though. Thanks a lot Julian. After some more research I'm starting to lean xtracycle with a front mounted seat. Fortunately I have an xtracycle dealer locally so now I just have to decide which bike, which seat etc. I'm leaning towards an Electra townie balloon 8i with a yepp mini. Decisions decisions! I might take a trip down to Portland anyway to chat with the Clever cycle folks and eat foodcart food and voodoo donuts. But I'm in Mexico till next week so for now I'll just keep over-researching this purchase online. Your sharing of knowledge regarding cycling with kiddos is so appreciated. Hopefully I can do the same once I get rolling with the family biking. I've come back to your site again and again in my pursuit for the perfect multi-kid cargo bike. THANKS for your thoroughness! I am leaning toward the Madsen, but I have a general concern regarding performance on hills and gravel roads. (I live in rural Alaska, and that's all we have.) Can you address this? Is there any other lower-cost kid/cargo bike that might handle long hills and crappy roads better? I have had trouble on gravel/dirt trails. The kids feel safer without cars around and tend to be more wild which throws off my balance. We've never had a fall, but I have yelled on occasion to settle down! More of an issue is parking the bike or taking a break with kids in the bucket. The rubber tip on the kickstand fell off within the first week and we superglue it back on every few months. It needs to have stable purchase to keep the bike up and any bit of unsteady pavement, ground, gravel, etc is a problem for it. Thanks for the review. We're loving our Madsen 1.0, but really appreciate hearing your thoughts about the new model...tantalizing! Quick question, if you don't mind. Which 5-bike rack did you purchase for your car? I'm thinking of getting a rack for the back hitch of our car, so I was eager to learn more about which one works with a Madsen, and how you fit your Madsen on your bike rack. Thanks for the great website. Always inspiring! Thank you for reviewing the new Madsen...I saw one down in Columbia City this weekend and literally said 'voila' out loud. What a great concept - having the cargo/kid in the back where they can have plenty of room. We currently have a 1 year old and 4 year old in a trailer, and the little one tends to bug the heck out of the older one when in such close proximity...ah, rugrats. Were you serious when you wrote that anyone in Seattle could borrow your old Madsen for a test ride? If so, then I would love to! I called both Recycled Cycles and ABR, which are listed as dealers, but neither are going to continue to carry it. I'm sold! I love the robin's egg blue. DId you find it wore well given how light it is relative to the black? It did collect some scuffs and dirt, but cleaned up reasonably with a scrub pad. It's still my favorite color MADSEN. I am so jealous I don't have this 2.0 version! But I'm okay with the "wobble" you speak of, now that I'm used to it I hardly notice. VERY jealous of the front wheel lock, since the bucket is sometimes challenging to find a good locking parking spot. What I think I would REALLY like is the slightly lower centre of gravity. I found it very top heavy when we had Dexter in our version of the car seat hack. Though, I think I could definitely get on board with drilling into the bucket to do something more like your hack (once we have another baby and will need to accommodate two kids of different ages). Perhaps the hole would be good for draining the thing out when washing the bin/using it as a beer ice box? Thanks again for all your good work, you guys are truly a family biking inspiration! I consider myself a faithful disciple. Hi Julian, I really loved the reviews- it has been great inspiration to save up and purchase a Madsen. Before I buy one, I wanted to ask a question regarding the ride. I used to pull my two children in a Schwinn trailblazer attached to a vintage Miyata. It was definitely not ideal since the bike itself is pretty heavy and the trailer was always getting flats. I am a small person, and I found it pretty strenuous, and wanted to know the comparison between pulling 50lbs. of weight in a cheaper trailer vs. the Madsen. I've read comments about the efficiency of the Madsen making it easier to haul loads, but wanted to know about other peoples experience. Definitely consider hacking the bucket to put baby lower, and maybe even lower the toddler seat. I've thought about making a semi-permanent on the down-low toddler bucket seat to replace the bench seat behind the driver. For naps and lower COG. Using foam to fill in the bottom of the bucket a bit, and maybe remounting the seat belts. And yes, more holes in the bottom of the bucket are a good thing when it comes to adult summer escapades. As for inspiration, you guys have me marveling at your ability to still do "pre-kids" type outings and evenings with regularity (and style!). 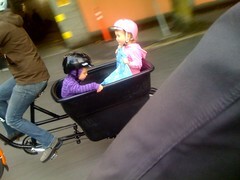 I find cargo bikes in general to be preferable to trailer weight when it comes to schlepping 2 kids. But it still can be hard on hills (easier than a bakfiets, however). Hence our cheap e-hub from cleanrepublic.com ... best to demo if you can, with weight. Are you still happy with the clean republic electric assist? Did you get the disc brake working? My kids are pretty big and I'm worried about hills. Am thinking about just doing the cheaper model since I won't go too far. Unless you think the extra 5 lbs is worth paying more for. Hi, would you tell me the dimensions of the bottom of the bucket? 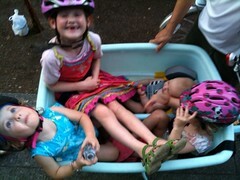 I'm trying to figure out how to attach the bucket to a trike so I can start hauling my kids around.... I'm no good on two wheels. Go to Clever Cycles' website and click on their family and cargo bike page. There are at least 3 trikes that would be ready to go for kid haulin'. 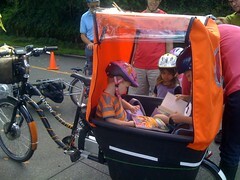 The problem with the options on Clever Cycles is I'd really prefer the kids in the back. If I'm going to spend so much, I want to like it. Is there something I'm missing? Aside from being able to see your kids more easily is there some benefit to having them in the front that I should consider? I think having the two wheels in the back would make the bike more maneuverable as well as slightly more aerodynamic. I think as far as safety I'd also prefer the kids in back so I can see traffic or obstacles more easily. I don't even like crossing the street with my giant double jogging stroller because I feel like sometimes I can't see around corners as well as I'd like. Do you still have the Madsen? Are you able to give me the dimensions of the bottom of the bucket? I was also wondering if the base of the bucket was flat. I plan on getting a flatbed trike and drilling holes in the flatbed to screw the bucket on. I'm thinking I'll also use steel or aluminum reinforcing brackets inside the bottom of the bucket to relieve stress to the holes in the plastic.. I'm trying to plan this from just looking at the pictures of the bucket on the Madsen site (which aren't that great). It seems to me that the base of the bucket is just screwed onto the Madsen bike with 4 screws. Can you confirm? Are there any other screws in the center of the bucket? If you could email me any pictures that would be fantastic! Thanks for the quick response and suggestion! There's a ridge in the middle to straddle the back tire. I haven't looked closely to see how its bolted on. Are going to buy a $1500-ish bike just for the bucket? Will Maddened sell you a bucket by itself? If I had a trike I liked, I think a custom built plywood box would be better than trying to somehow stick the bucket on. I thing the hump in the middle is a necessary evil, and if you're not straddling a single center back wheel, you can do better with wood. I don't know how to post a picture here and I don't have my own blog or website. There must be pictures somewhere though... Good luck with project. Madsen was willing to sell me the bucket separately. I considered building a wooden box with benches, but I'm moving to GA and they seem to have pretty strict biking laws as to how you can transport children and passengers. I'm a New Yorker and that's bad enough, I don't need to make the Southern police mad at me, LOL That was why I was trying to find something manufactured by a company specifically to hold kids. I'm pregnant with my 3rd child and God-willing I'll have more. The bucket isn't perfect, but I'm struggling to find other options to hold 3 or more kids, especially something that can hold an infant. I'm not keen on the idea of wearing a baby carrier on a bike. Interesting project! I'm with Karen on strongly considering a trike over kludging a MADSEN bucket onto a trike. I tolerate kids on the back for the other benefits (cost, hill-climbing) of the MADSEN but really do prefer kids in front. I can keep an eye on them, break up fights, and it's much more social. Very easy to see over the front of a Christiania or Nihola. But I hear you on your reasons why, and will be curious to see how it works out if you pursue it. I do worry that the bucket seems designed to have most weight on the rear tube and not on the narrower footprint on the bottom. We have a madsen that we bought last year and brought with us to England. So far we've had no trouble with fading, however ours is light blue, so I suppose fading wouldn't be an issue, if you had the black one it might be more of an issue... eventually. Also our 2011 model did not have drain holes but that was easily fixed, we drilled 2 small drain holes in the back at the bottom and it drains nicely and stays dry now. sorry about that, now I see that the previous comment is from July 2011 even though I just got the e-mail notification of a new comment , which is strange! Hi - I'm considering the purchase of a Madsen. I have a 1 year-old, a 4 year-old and 7 year-old. I'm wondering if you think a baby seat on the front would feel okay to give the bigger kids more room to ride in the bucket? Hi Julian, how did you transport it on the 5 bike hitch carrier? would you be able to take a picture of it?